In the first part of this post, I had very briefly painted the big picture and also subtly emphasized on the need for a more agile and flexible IT (Information Technology) infrastructure for enterprises. In this article, we will wear the hat of an IT innovator and see some of the aspects of a manufacturing enterprise that an IT leader will need to consider in the process of choosing an SOA-based approach to manufacturing. A wise leader is one who chooses to build an enterprise that is flexible to this permanent phenomenon called Change. With Change being permanent, the onus is now on the leader to make sure that this Change always happens for the good (a positive change) and with minimal incremental cost. In the context of Information Technology, IT Leaders are often presented with such situations of having to make a choice between multiple solutions. This is when a leader needs to look through the telescope and see the solution from a long term perspective. An IT architecture that will scale up faster with minimal change with high utilization of existing investment and legacy systems is the basic need. The manufacturing space is flooded with a lot of industry standards, and the IT infrastructure has to be able to support all of these industry standards. The standards defined by ISA, like the SP95 and SP88 models are the core of any manufacturing industry. It is very important that an IT infrastructure supports the ISA SP95/88 models at the least. With the advancements made in the technology space, the IT infrastructure should be able to support the latest concepts of social networking, blogging, wikis, instant messaging, etc. Also, this new infrastructure has to be able to support newer hardware technologies like newer readers, sensors, mobile devices, embedded devices, etc. Also, with the generation-Y people coming into the manufacturing workforce, it becomes an even more challenging task for the IT Leaders to create an IT infrastructure that will attract more of this new generation engineers to the manufacturing industry. With so many factors to be considered, a flexible and agile IT infrastructure is the key. AMR Research precisely defines an SOA-based approach to manufacturing in its article titled Manufacturing 2.0: Defining Next-Generation Manufacturing. IBM has been a leading player in this space, with a structured approach to Manufacturing 2.0. IBM has partnered with several key players in this space to provide its customers with the Industry Frameworks approach. 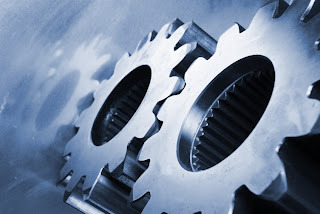 These frameworks helps the IT Leaders look beyond just MES or ERP systems...into creating an integrated manufacturing enterprise. MIP's Tryst with the Moon - ISRO does India Proud! When many young minds in India were enjoying the Children's Day celebrations, ISRO and the nation had another reason to celebrate - The successful placing of our Tricolor flag on the Moon! Yes, from now on, India has two reasons to remember November 14th. We are the 4th country in the world (after US, Japan and Russia) to have implanted the national flag on the Moon! 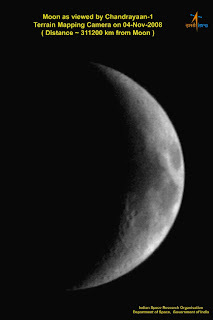 The Moon Impact Probe (MIP), one of Chandrayaan-1's 11 payloads hit the Lunar surface near the Moon's South Polar region at 20:31Hrs IST today. Many may see the coincidence with Pandit Jawaharlal Nehru's birthday and this great event (as it was only when he was India's Prime Minister that India's space programme was launched). But I, on the contrary, see a different coincidence. MIP was Dr.A.P.J.Abdul Kalam's brainchild, and in today's world, he is an inspiration to children across the country than anyone else. ... a series of automatic operations that began with the firing of its spin up rockets after achieving a safe distance of separation from Chandrayaan-1. Later, the probe slowed down with the firing of its retro rocket and started its rapid descent towards the moon’s surface. Information from the its instruments was radioed to Chandrayaan-1 by MIP. The spacecraft recorded this in its onboard memory for later readout. Finally, the probe had a hard landing on the lunar surface that terminated its functioning. To read a first-hand report on this spectacular space mission, go to ISRO's very own press release here. This is just one of the first steps of Chandrayaan-1. But the point to be noted is that MIP is totally indigenous to India (developed by Vikram Sarabhai Space Centre of Thiruvananthapuram). So, essentially it's the first completely-Indian object to land on the Moon! Do stay tuned to www.ISRO.org for continuous updates! Oh, we are going through tough times...while some of my customers are more resistant to new initiatives, some have declared really negative earnings for this quarter. I believe we need to wait and just let this period pass through...but again, the pressure build's up from my bosses! This was actually told by a acquaintance of mine. I'm not surprised by this, as I've heard many others say this too. Echoing these words a few more times makes things more lucid than what it actually sounds like. As I've always believed in, every challenge comes with a set of opportunities. Since the past few years, one would have noticed the change in way businesses across the world starting looking at the market. We've seen a number of mergers and acquisitions (M&A) and joint ventures (JVs) happening across the different businesses. The resulting IT complexity has always been a challenging task for CIOs and other IT leaders of these businesses. What better news can IT vendors get? There is a CIO who is crying "It's a mess - HELP ME OUT!" This is the time when IT vendors need to wear the innovator's hat. 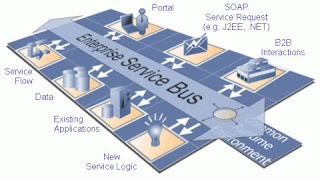 These times are the ones that offer utmost opportunities to IT solution vendors. India is a garden of such opportunities especially in the manufacturing space. From automotive to petroleum to steel industries, all companies are eying India as a preferred destination for setting up shop. Unlike the past, international players are looking at setting up joint ventures with Indian companies that helps them enter a new market in many ways. On the other hand, Indian biggies are acquiring companies in other parts of the world. This has resulted in the merging of companies due to acquisitions, which again has posed considerable challenge to the IT heads of these companies. M&As are more than just two corporate entities merging. It's about merging of cultures, merging of values, merging of corporate and IT governance models. So, in a nutshell, to an IT leader, such market moves (M&As and JVs) mean more than just "IT" integration. In my next article I would be diving a little bit deeper into this topic to talk about SOA in the context of manufacturing. Till then, stay tuned! My New Adizero - Here is how I selected my shoe.. I've dated injuries related to running for over three months now. Recently when I consulted Dr.Rajat, he diagnosed the problem to be due to ITB (Iliotibial band) in my left knee. Having said that, he had suggested me to buy a shoe that had a good support for over-pronation. He also suggested me the Adidas Nova Control ones or the Nike Bowerman series ones. I visited the Adidas running website and went to their shoe section. I was surprised to see such a good website that was made available for customers in India (its clear that Adidas has understood the growing number of runners in the country!). The slider panel on the left hand side had three selections that would essentially take inputs from the buyer. 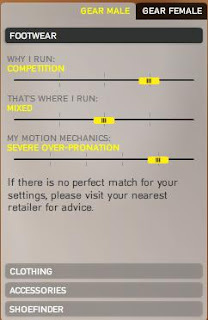 These inputs included "Why I run? ", "Where do I run?" and "What are my motion mechanics? (related to pronation)". Once I made my selections (as you see on the left), it presented me with a set of shoes that was filtered out from the entire basket. With this list in my mind, I decided to visit the Adidas store in my city (Chennai, India) to spend some time and buy the right shoe. On Saturday (8th Nov), I visited the Adidas store in Chennai. 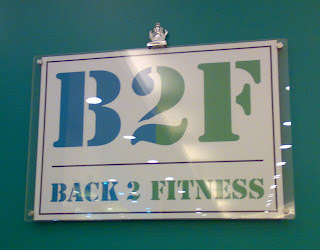 Apparently, its Asia's second largest Adidas store (with the first one in Bangalore). 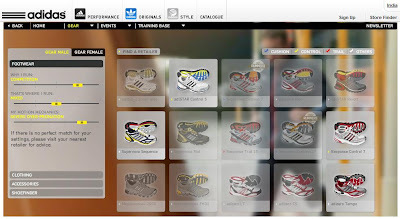 There, I got my feet scanned with Adidas' very own Footscan™. The adidas footscan™ process is simple and it was a 5minute process. 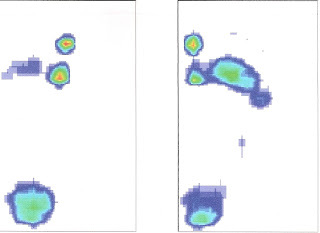 The footscan™ pad records the pressures created through your foot strike, and the software interprets this data to provide an accurate, graphic representation of your footstrike. My foot scan looked like the one on your right. I finally tried out different models of shoes in the store, and decided to buy the adiZero Tempo. The damage to my pocket was INR 7500 (USD 158)!! I know that this is a steep price.....but I had a reason to spend. My existing shoe is worn out (I've done more than 400 kilometers in it) and I'm just 26 days away from my first full-marathon in Singapore. To top it all, I'm 'still' recovering from my ITB problem. With all of this, I cannot dare to run the Singapore marathon with the worn out shoe. I'm also a believer that when you want to achieve the best result, equip yourself with the best support system. The Torsion® System creates stability and control and provides midfoot support. Cushioning material that retains natural propulsive forces for greater forefoot efficiency. Maximizes heel protection and stability; is located under the heel to provide extra protection from harmful impact forces. A non-marking rubber outsole compound offering abrasion-resistance and durability. Ghillie lacing system provides a secure and custom fit. That's not all about it! I did something really daring yesterday with my new pair of adiZero. To know more, Stay Tuned!! 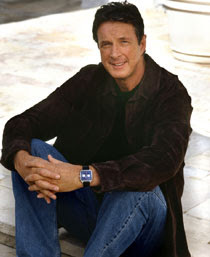 Michael Crichton, one of my favorite sci-fi authors bid adieu to the world yesterday (Nov 4th) at Los Angeles. Known to have been battling with cancer for a long time, his battle with life finally has ended. He had just completed 66. I've been a great fan of his books like Congo, Jurassic Park, The Lost World and the State of Fear (though I didn't completely read this one). His exemplary skills of portraying the bizzaire effects of scientific experiments is something that has keep me gaping everytime I read his book or see his movies. Michael, you will stay in my heart (and the hearts of many other readers and fans of yours) forever! May God bless your soul! 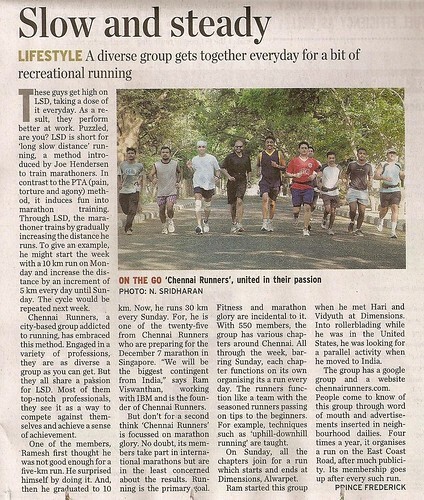 Chennai Runners is back on The Hindu! Oh yes, we are back on The Hindu. Prince Frederick from The Hindu was with us last Sunday to talk to us about our group and our plans for the upcoming Standard Chartered Singapore Marathon. Below is the paper view of today's article. You can find an online version of the same here. Having had my share of injuries due to running, I finally decided to seek the expert's help. That reminded me of Dr.Rajat, a doctor who runs! Though I've heard a lot about Rajat, little did I know that he was practicing in Bangalore until Shahid told me. I got his clinic number from Shumit and managed to get an appointment for 1st Nov. So, I made a lightening trip to Bangalore to meet Rajat at this new clinic Back to Fitness which is located in Total Mall on Sarjapur Road in Bangalore. The clinic looked really impressive with a whole lot of equipments for exercising and diagnosing sports-related injuries. I had an appointment with Rajat at 12noon, and I spent about 30minutes at this clinic. And, his observations were - I was pronating my feet inside while running and also the injury was not a lateral-collateral ligament strain, but an Iliotibial band problem (popularly known as the IT-Band problem). He taught me a couple of stretches that would help in reducing this pain (and the problem). Unlike the lateral-collateral ligament strain (which can only be cured with rest and applying a lot of ice packs), the IT-band problem can be treated with appropriate stretches. I also seem to have really tight calf muscles, which could also be a potential reason for this pain. I did a wonderful 12K run yesterday in the hot Chennai sun (from 9:15AM to 11AM), and finished strong (without a drop of water to drink....as I forgot to take my fuel belt!). Rajat's words and yesterday's run have given me a lot of hope and confidence that would be a driving force for the rest of my Singapore marathon training.